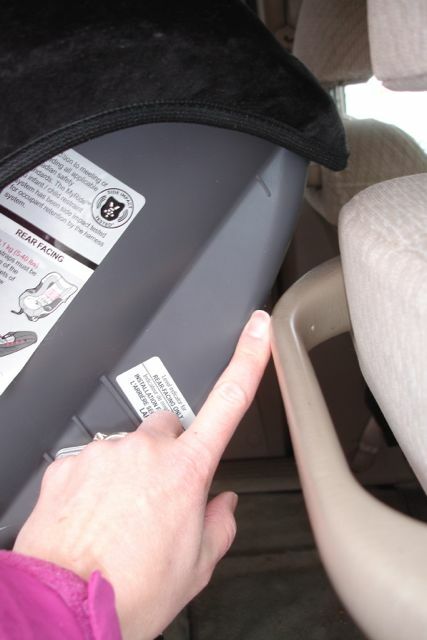 We are frequently asked about the angles at which a rear-facing seat may be installed. 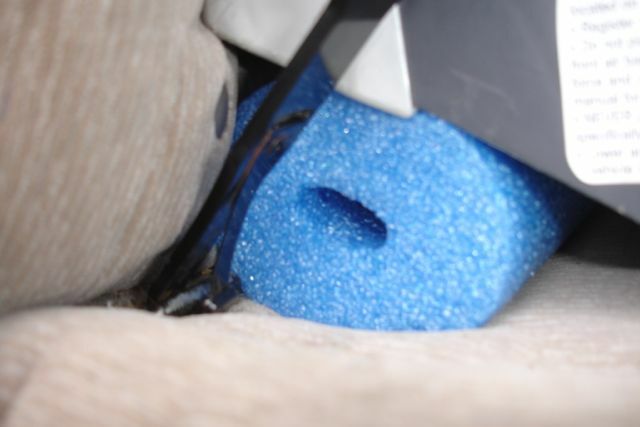 We tend to recommend seats more often that permit a range of angles, and how a particular seat fits in any given vehicle depends very much on that range. Except it isn’t always a number….confused yet? 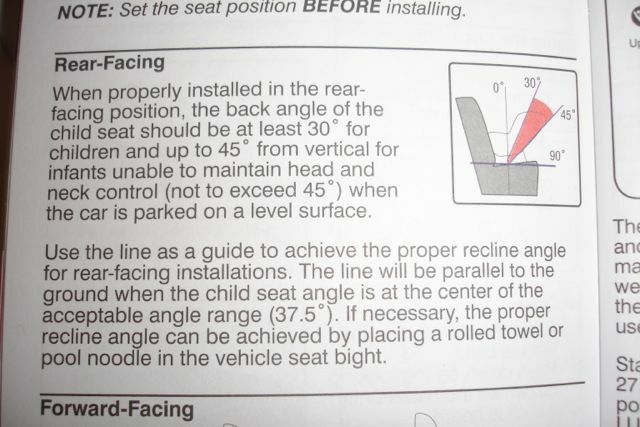 Using as little math as possible we hope this article will better explain why install angles matter to your child’s comfort and safety, and can gain or lose you front seat leg room in the process. Read on! 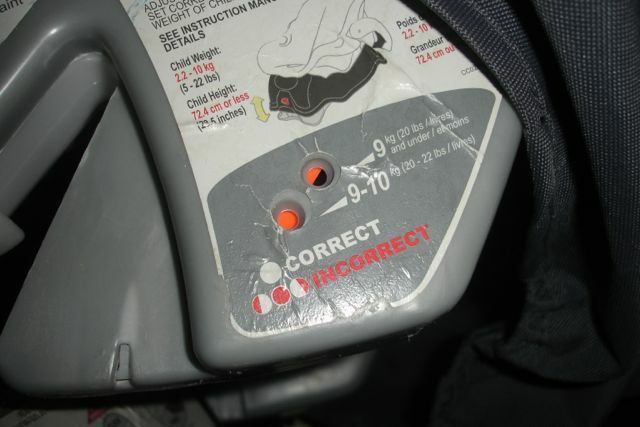 We are guilty ourselves of using the numbers 30* and 45* when that isn’t always accurate or useful, particularly when seats are shaped so differently, vehicle seat geometry and upholstery cushioning can affect things, the measurement location isn’t always mentioned, and considering the installation technique of the installer. Where did those numbers come from? 45* is approximately how much a newborn needs to recline (lay back) in order to protect the airway, when measured from vertical. A giant head plus a weak and floppy little neck can easily mean a compromised airway if a newborn is too upright in his or her seat. Imagine folding a straw in half: that’s about what’s going on when a newborn’s head flops and can not be picked back up. 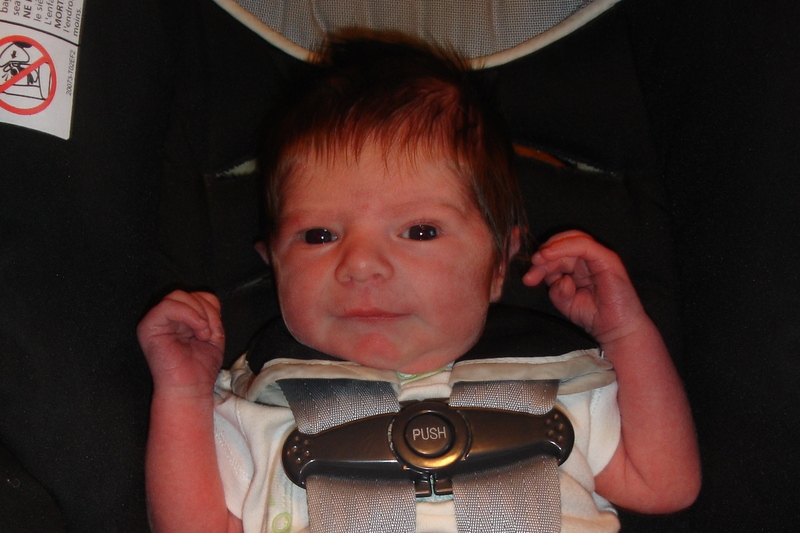 It is very important to maintain the most reclined angle permitted in whatever seat the newborn is in. 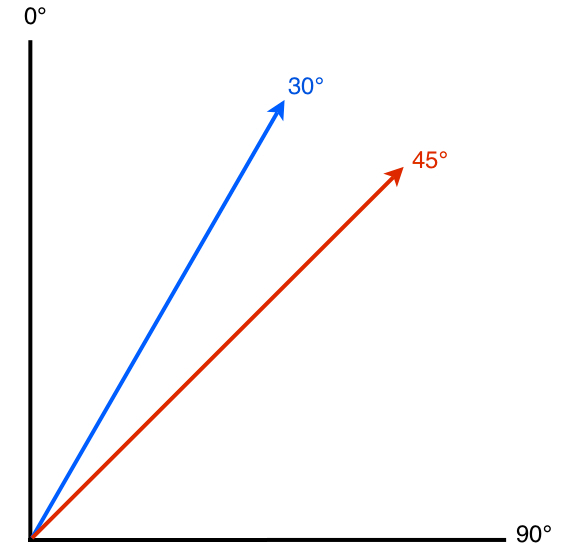 That being said please do not immediately bust out a measuring device like an angle app (although we use one in this post to explain some things later), a protractor, or anything else. 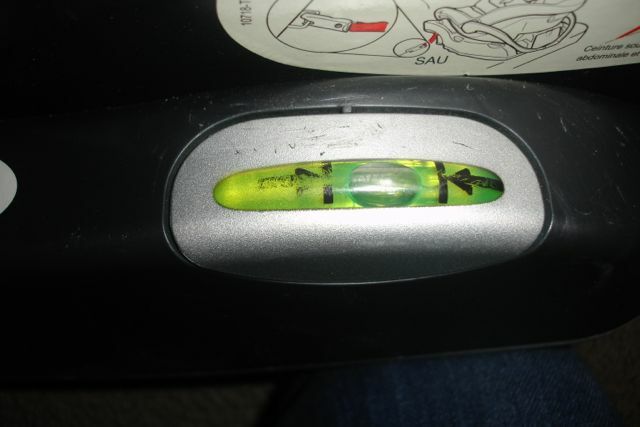 Your seat came with the best measuring device of all – the built-in angle indicator right on your seat! 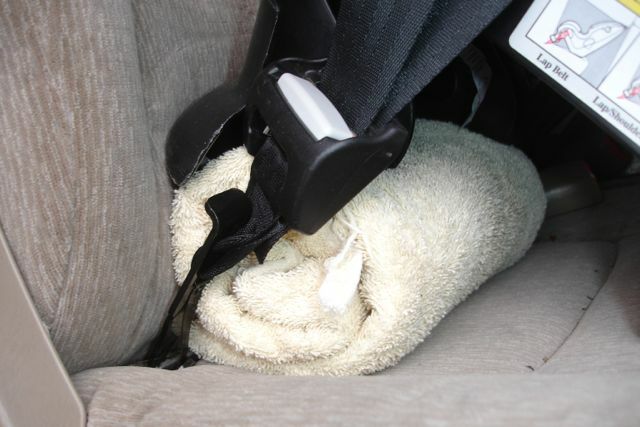 If a newborn’s head still flops forward when the seat is at the most reclined angle consider removing any head padding/insert (if permitted), or perhaps that the seat is not a good fit for the shape of the child. 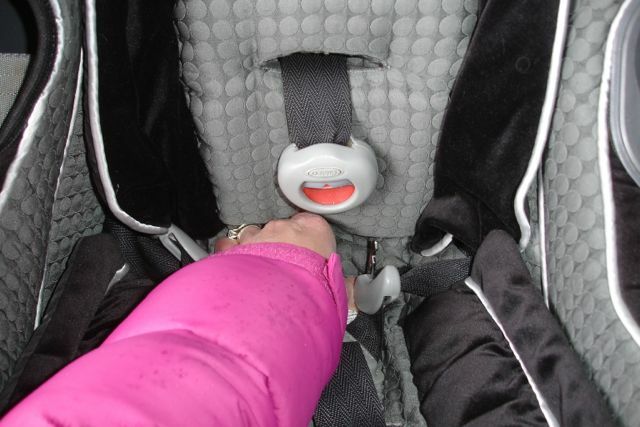 In that instance we would recommend a different seat, or if that is not possible, to have an adult sit in the back with the newborn to monitor head position, and limit travel until the baby has the needed head control to tolerate the position. Manufacturers are free to put any single or range of angles on their seat, provided the seat passes testing within that range. 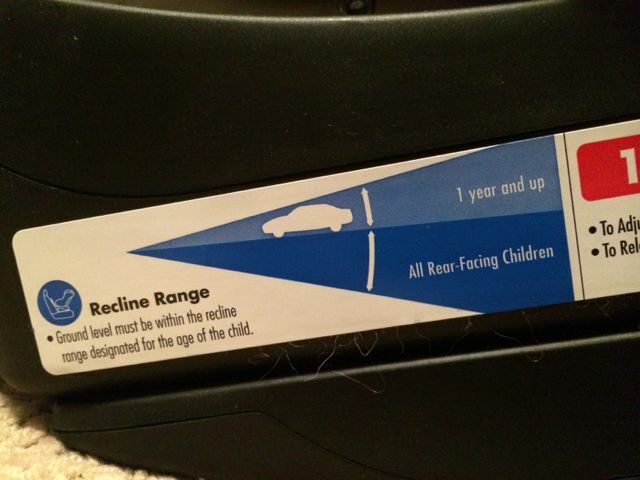 Some manufacturers specify a very particular range based on weight of the child, some allow an open range based on preference of the child/parent, and some specify a single recline angle. The critical limit that can not be exceeded during testing is that the seat must not recline past 70* (measured from vertical) during the crash sequence. 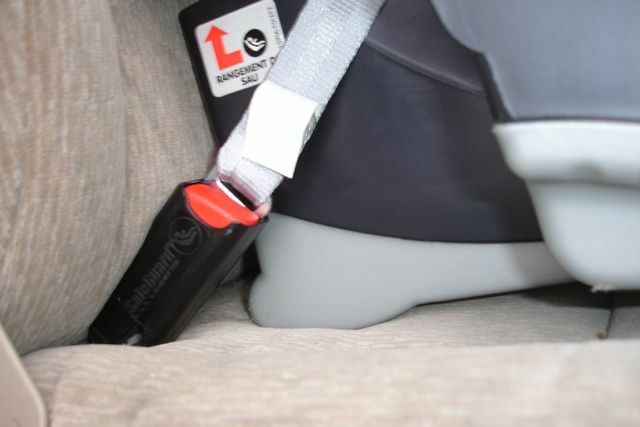 Therefore, a manufacturer will determine for their own seat what is the maximum recline angle for installation, and if the seat must start more upright for heavier kids in order to remain within that limit (as heavier kids would rotate more in a crash than lighter kids). Exceeding that limit risks greater chance of injury to the child as the seat over-rotates and begins to perform not as intended. 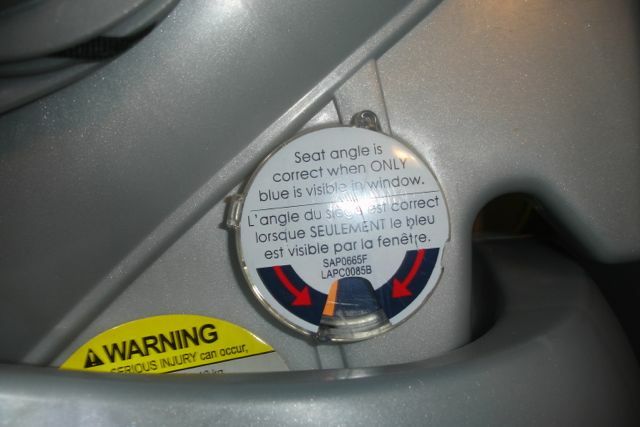 The flip side is installing a seat more upright than is allowed, which runs the risk of the seat rebounding more than was intended, and again risks greater chance of injury to the child. 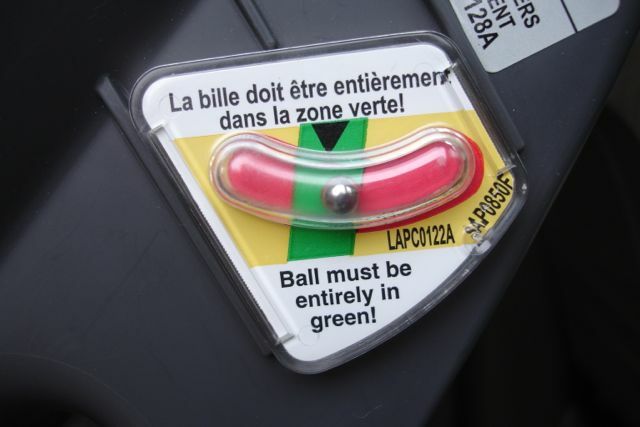 Here are a few types of angle indicators as seen on various seats: lines on a sticker, lines embossed on the plastic, gravity dials, bubble levels, rolling balls, or none at all. Do you recognize any? 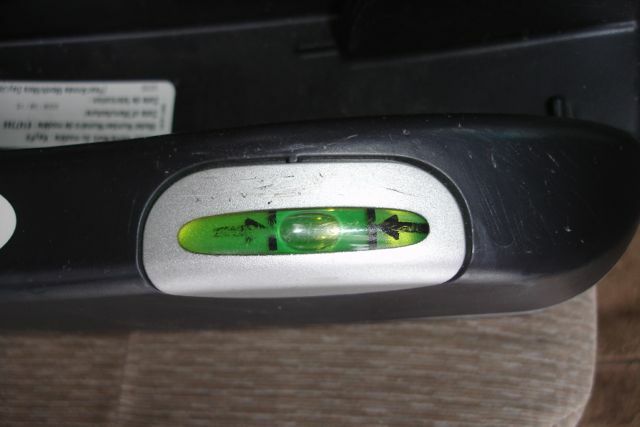 Manufacturers are not required to have angle indicators on their seats, but if one is present (and most seats do have them) then they must be followed. 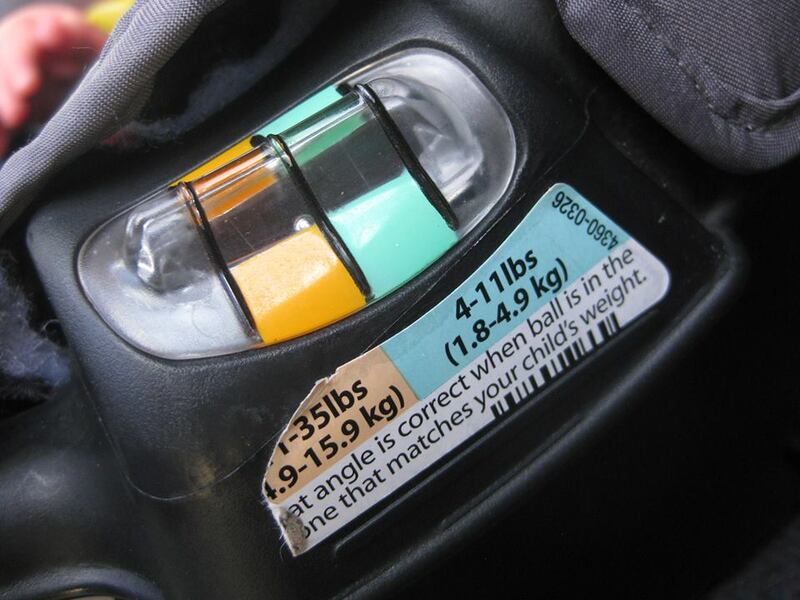 Engineers don’t sit around designing parts on car seats just for fun, so if there’s a very deliberate instruction for how to recline a seat…respect the design process and follow the indicator for maximum safety! 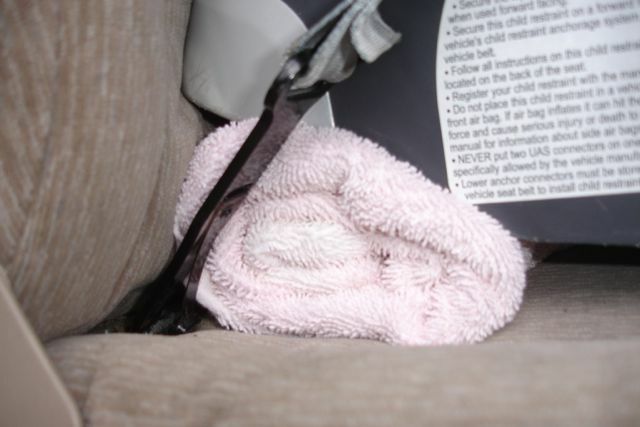 In addition to a manual reclining mechanism via a flip foot or lever, SOME seats permit the use of a single pool noodle (firm foam cylinder), a trio of noodles (3 maximum), or a tightly rolled towel at the seat bight to prop up the front edge of the car seat and make it more reclined. 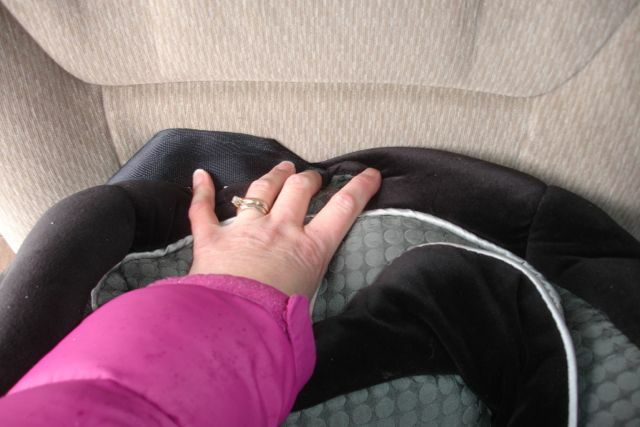 Whether you need this or not will depend on your car seat, your installation technique, the squish and textile of your upholstery (leather tends to require a noodle more than fabric does), the age/weight of your child, and how sloped your vehicle seats are to begin with. How do you know if you need one at all, or if one is permitted? Read your manual of course! This is just one example and does not apply to every seat. If noodles or towels are permitted your manual will say so. But how, you ask? Do you struggle to achieve the correct recline angle? Perhaps the following will help. 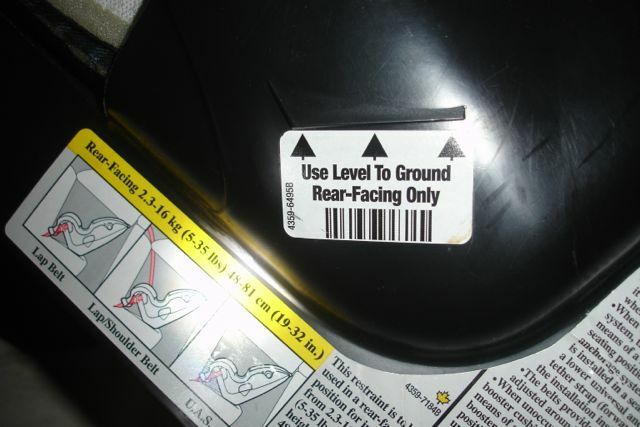 If the angle indicator on your seat relies on gravity to work make sure you are parked on flat ground. 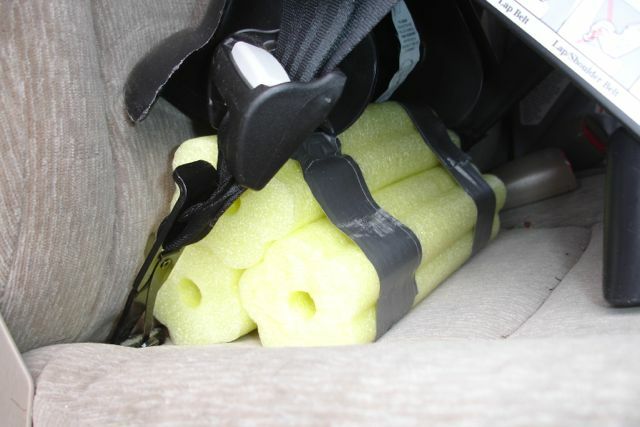 Left to right, top to bottom: Front edge of car seat wedged against squishy upholstery – no prop required to achieve desired recline; single piece of small diameter red pool noodle props up front edge of car seat; single piece of large diameter blue pool noodle props up front edge of car seat; tightly rolled small towel props up front edge of car seat; tightly rolled large towel props up front edge of car seat; three small yellow noodles taped together to form a stable trio props up front edge of car seat. 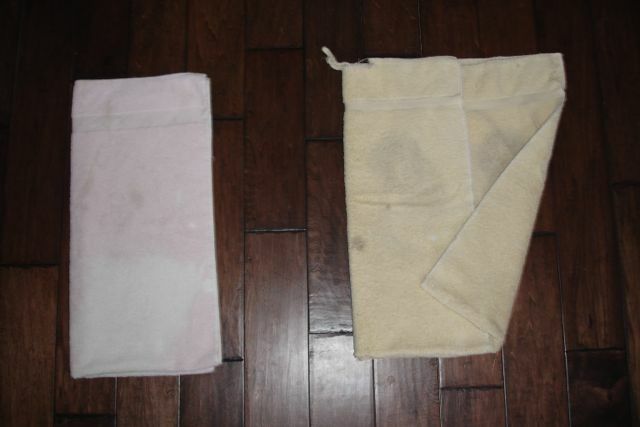 In addition to using noodles or towels you can also vary the final angle by where you compress when installing. 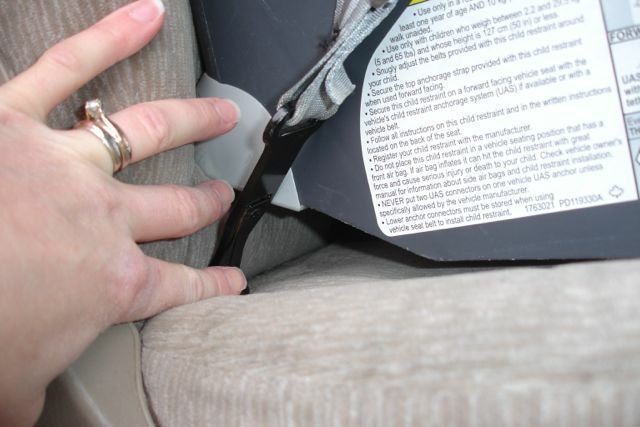 To make a seat more upright compress at the child’s foot area. To make it more reclined compress at the bum area. Let’s back up a minute: WHY do we tend to prefer seats that allow a range of allowable angles? Seats that permit a more upright installation with older children who can tolerate it (i.e. 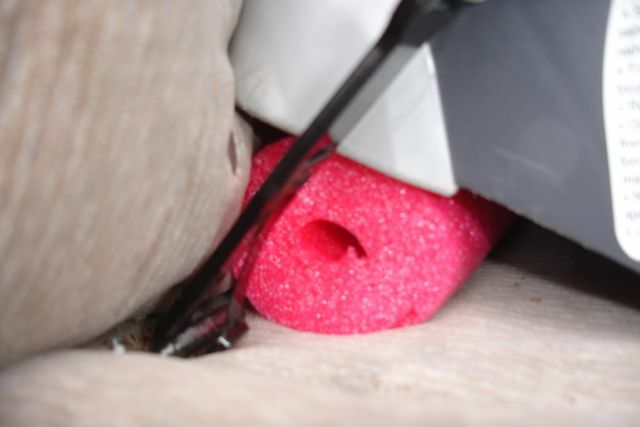 have the appropriate head and neck control) tend to take up less space front-to-back than those requiring a single line level to ground installation. 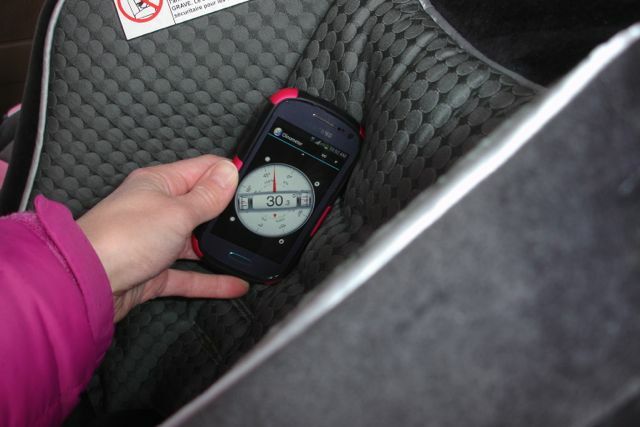 For example here is a Graco MyRide, one of our favourite go-to infant/child seats for smaller vehicles. Fully reclined for a newborn there isn’t much clearance between it and the front seat slid all the way back. Install it as upright as permitted, however, and inches are gained. 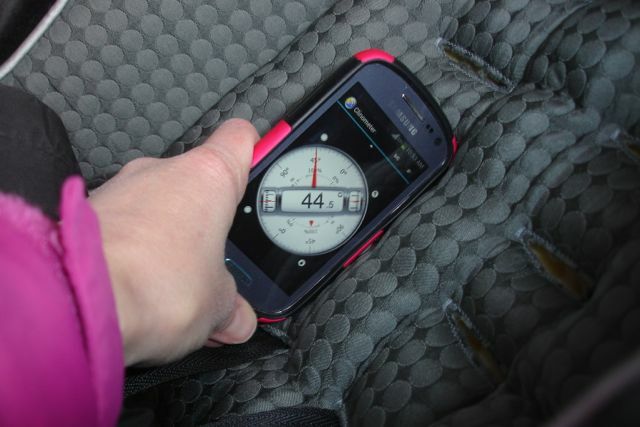 In a small car this can mean the difference between front passenger comfort and eating the dash. 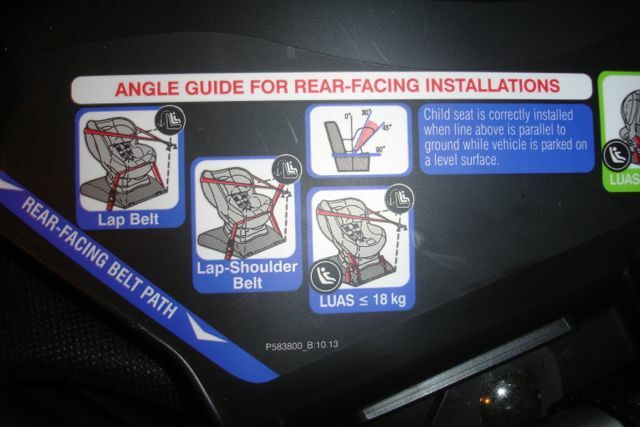 Changing the install angle according to the indicator of course changes the angle at which a child will be positioned in the seat. Remember how we said earlier we don’t really use measuring tools? 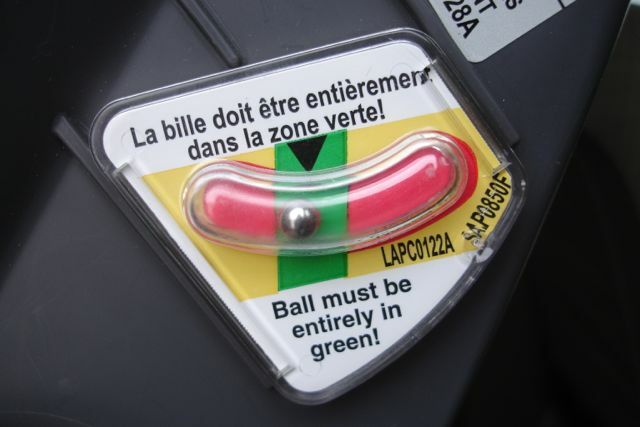 You don’t need to – it is completely irrelevant what any measured angle is on a seat if you are following your seat’s angle indicator. However, for illustration purposes here’s what we got, the caveat being again that it DOES NOT MATTER what the level app says, and it can be varied several degrees quite easily depending on how or where the level was compressed. Fully reclined (approx. 44*)/ fully upright (approx. 30*). Infant seats often, but not always, have a built-in mechanism for adjusting the recline angle, in the form of a recline foot. Your manual will have instructions for how to extend or retract it as needed. If you need more recline than can be achieved using only the built-in recline foot you must consult your manual to determine if you may add a noodle or towel in addition to the recline foot, or if you must tuck the foot away and use only towels or noodles. 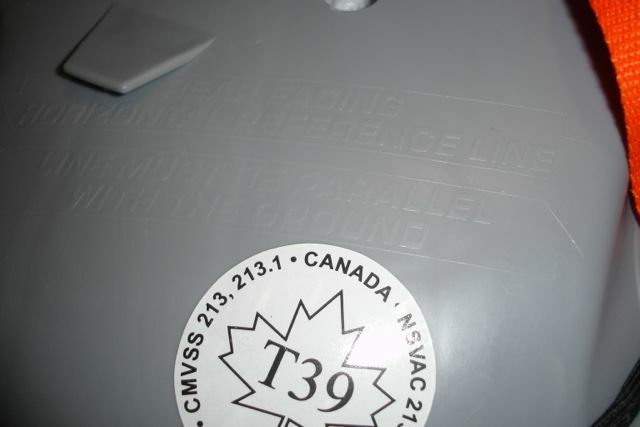 Sometimes the angle indicator on an infant seat is on the carrier, and other times on the base. Remember for newborns: recline as MUCH AS POSSIBLE while remaining within the allowable range. It is often a case of trial and error to get it just right. 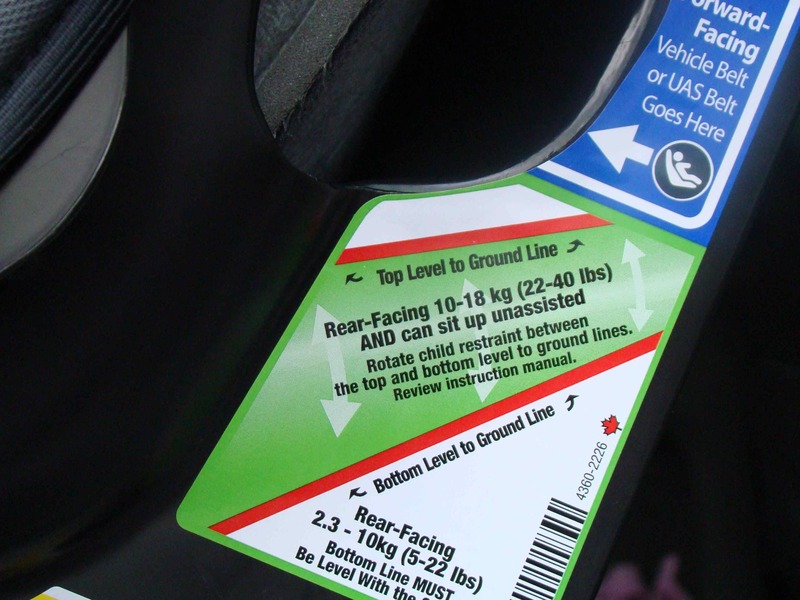 Remember to park on flat ground if your particular indicator relies on gravity; lines level to ground could be done anywhere so long as the line remains parallel to the ground. 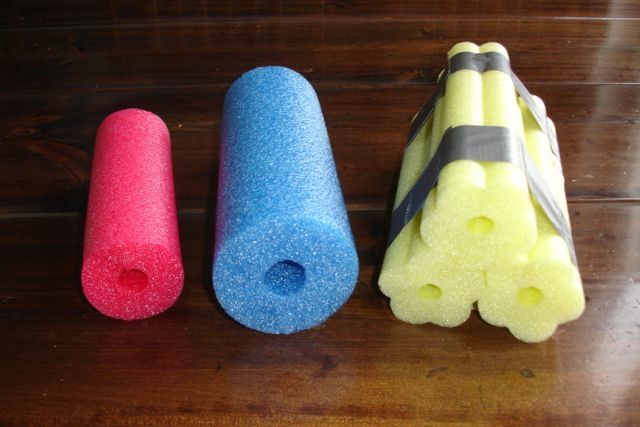 And now, a close up look at the props used in this post: various types of pool noodles, and tightly rolled and taped towels. 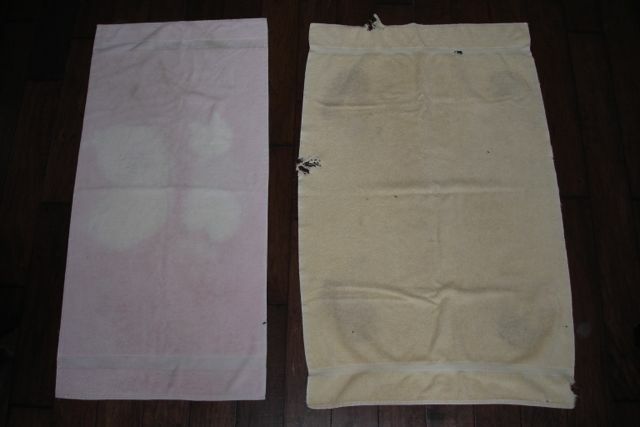 Don’t tape the towel until you’ve figured out how big you need it to be. 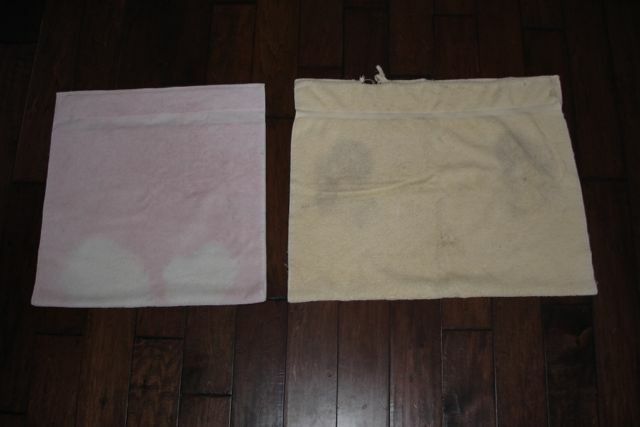 Sometimes you need a thin towel…sometimes a thicker one. Vary how you fold it. Double them up. 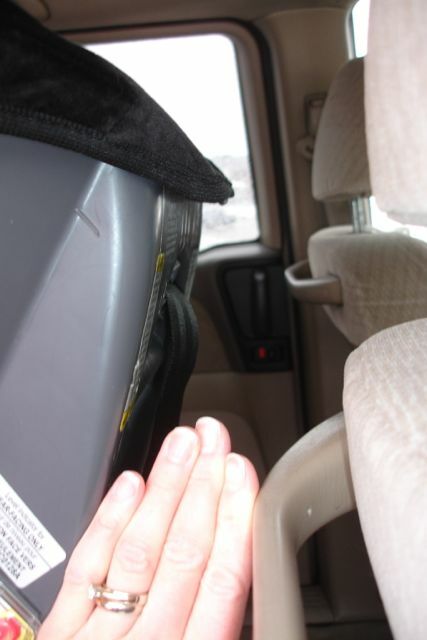 Make sure they’re narrow enough to not interfere with the lower anchors or buckling of the seat belt, as appropriate (about 10″ wide is usually perfect). How to fold (old, stained, ratty rag!) 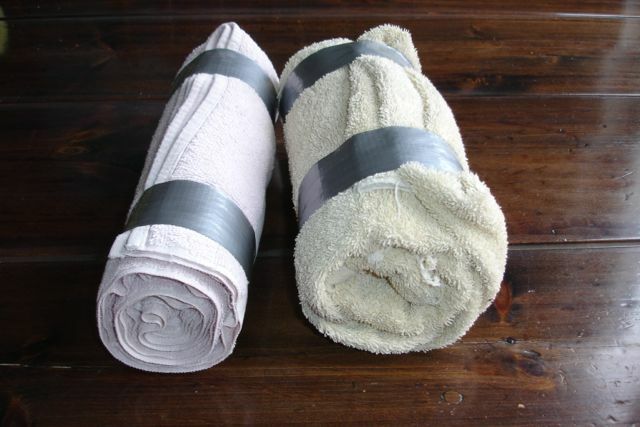 towels 101: fold in half, then in half or thirds, tightly roll, and tape. Voila! 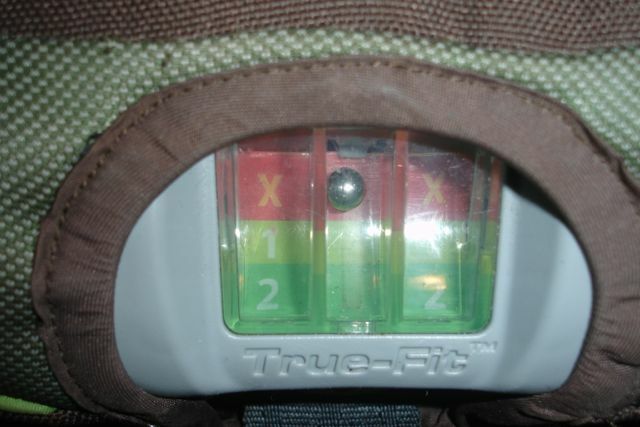 Do you prefer to see these tips in action? A short video demonstrating the various techniques discussed above. « CPS Week Treasure Hunt & Giveaway!